The installation is simple. Just go into the App listing admin area of your Shopify store, then click over our App icon, inside the app settings press Activate button. 1. Go to the admin panel and click the "Online Store". 3. Uncheck "Enable password page" in "Password page" block and save the changes. 4. Activate the Simple Coming Soon and click on icon of eye in the top right corner of the app settings, now you should see the Coming soon page. 1. Log in to admin panel of your store. 2. Find link "Online Store" in the left menu under "SALES CHANNELS". 3. Click on eye icon to the right of link "Online Store". And the second way is to relogin to admin panel of your store. 1. Got to app settings page. 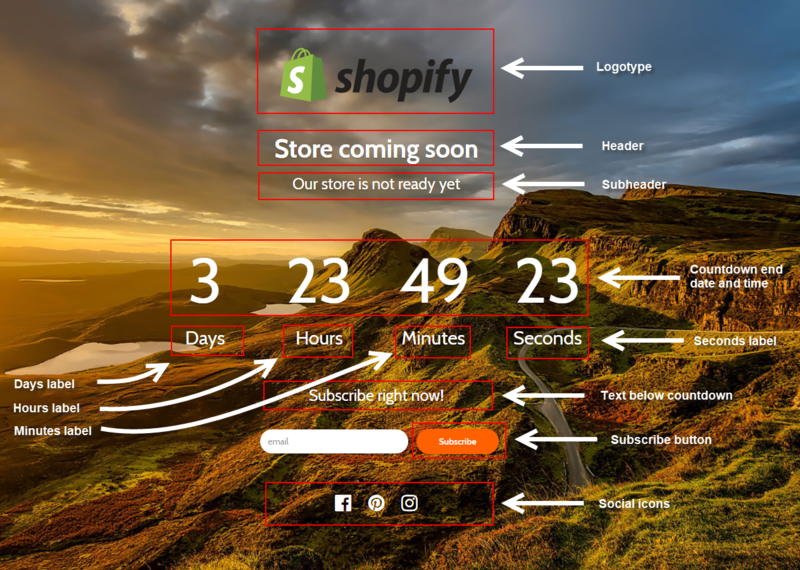 In the event that your store has been closed or frozen due to a lack of payment for the Shopufy plan, and then you have resumed the work of your store (or unfrozen it), you need to reactivate the application manually. Otherwise, the application will not work. 2. Uncheck the "Activate coming soon page" checkbox. 4. Check the “Activate coming soon page” check box back. 5. Click the "Save" button again. This way your coming soon page will be added to your page again. 1. Go to app settings page. 2. Untick the "Activate coming soon page" checkbox. 2. Click dropdown "Actions". Then press "Edit code". 3. Click "theme.liquid" in the left menu. 5. Delete all code before the "<!doctype html>". if something went wrong, please, contact us. We are glad to help. At the moment, the process of exporting your customers from Shopify to Mailchimp is rather cumbersome and difficult for the average user. To be user-friendly, we offer you our help. Please contact with us at support@kad.systems and we will help you to do it.